Inject your favorite flavored herbs, butter, sauces, or marinades under the skin of any wild game or turkey, beef, pork, chicken and even fish for added flavor and juicy moisture. This professional style marinade Injector is ergonomically designed and easy to use. Simply dray back on the plunger to fill the inject with your favorite seasoning, then slide the needle into the meat. 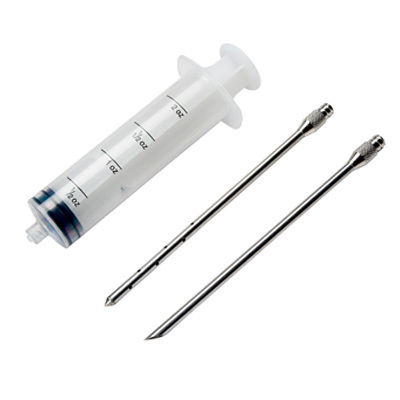 Injector has a 4" base with a 3" injector needles. 2 holes on opposite sides of the needle for greater marinade distribution.